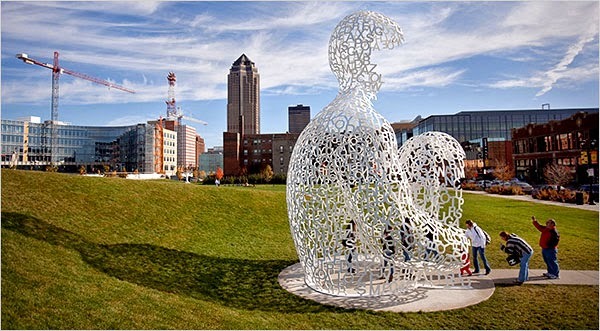 Jan, my language acquisition coach, who lives in Des Moines, Iowa, a city energized about five years ago by a beautifully landscaped sculpture garden, invited me recently to take part in teaching an online course called "Global Citizen." The course is offered through a collaboration between Omsk University in Siberia and Webilang, a web-based platform for learning English or Russian with native speakers. I imagined that by witnessing Russian speakers learn to speak English with more confidence, I might discover strategies to improve my Amharic. The first class of the 14-week semester took place two days ago, and just hearing Jan and Joe, one of the other professors involved, encourage the adult Russian students to make lots of mistakes reminded me that learning a language should be daring and messy, not timid and neat. One of the icebreakers for this initial class required us each to upload and explain a landmark from the city where we live. Jan chose to talk about the centerpiece of the John and Mary Pappajohn Sculpture Park. 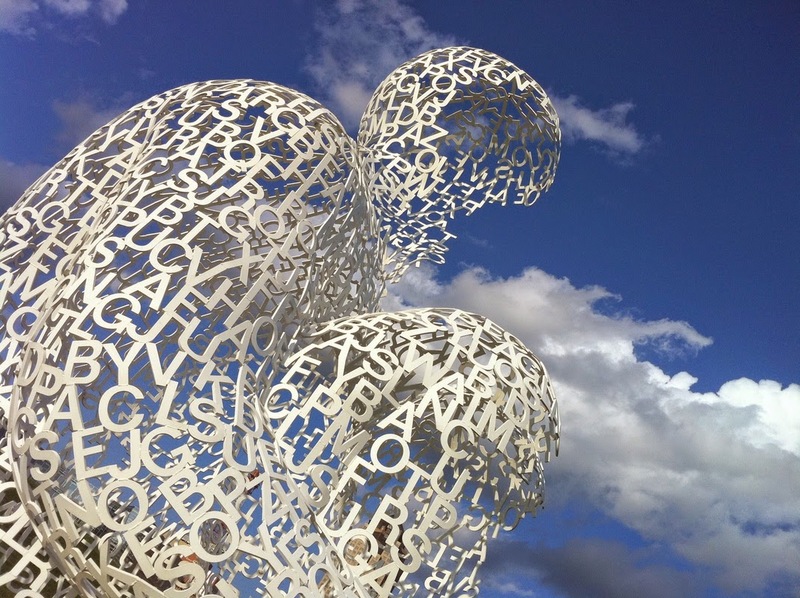 The sculpture "Nomade" by Catalan artist Jaume Plensa, in its permanent home in Des Moines. Plensa's use of letters reminds me of Wosene Kosrof's use of the Amharic fidel. 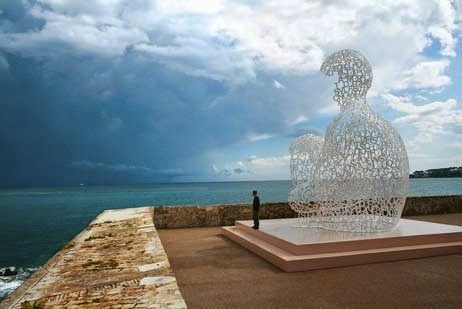 The sculpture's title—"Nomade"—made more sense when installed in its original location on the French Riviera, looking out over the Mediterranean Sea. I can't help thinking that this giant sculpture now in Des Moines is the perfect metaphor for my project of learning Amharic. Here I am using language to train my gaze beyond my own cultural practices in the United States and toward a distant land with very different ways of being and interacting. I often feel like a cultural nomad(e) doing this, with words and phrases from Amharic and so many other languages jumbled inside me. One of the reasons I wanted to work with Jan is precisely because I've initiated and abandoned so many linguistic efforts before. In fact, if I were the sculptor, the one alteration I would make to "Nomade" would be to include symbols from other languages I've studied that use a non-Latin script, including Japanese, Lao, and Thai. Perhaps I'd even place somewhere on the sculpture the German umlaut, the French circumflex, and the Spanish cedilla. Over the weekend, when I attended two different celebrations of እንቁጣጣሽ (EnquTaTash), Ethiopian New Year, I tried to see the strangeness in my own behaviors and expectations as well as the obvious foreignness of the Ethiopian traditions transplanted to the United States. For instance, as I struggled to remember the formal greeting for elders (I couldn't...but I now remember it's አንደምን ኖት, Indemin note), I thought how equally strange was my impulse to treat an Ethiopian elder (Professor Adugnaw Worku, who will be the topic of a separate post) as a casual friend. Or, as I became upset that music performances at the Home [away from] Home festival were running almost two hours behind, I considered how equally strange was my expectation that organizers adhere to the posted schedule, regardless of how the day unfolded organically. Or, as I watched people kissing the feet of the Ethiopian Orthodox Bishop as he walked with his entourage through Oakland's Mosswood Park, I remembered how equally strange were the actions I performed weekly during my Catholic upbringing. 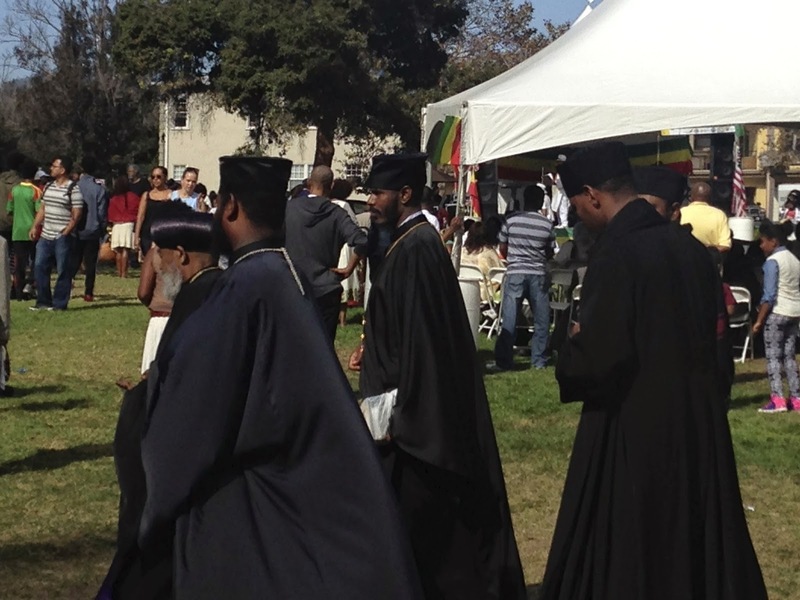 90-year old Bishop Abune Melketsedek leading a group of Ethiopian Orthodox clergy through the festival grounds. While I did attend these two festivals to make more connections and gain more insights into my project, I also wanted to listen to rousing Ethiopian music, eat delicious food, and share the experience with Anemo and Suzanne. 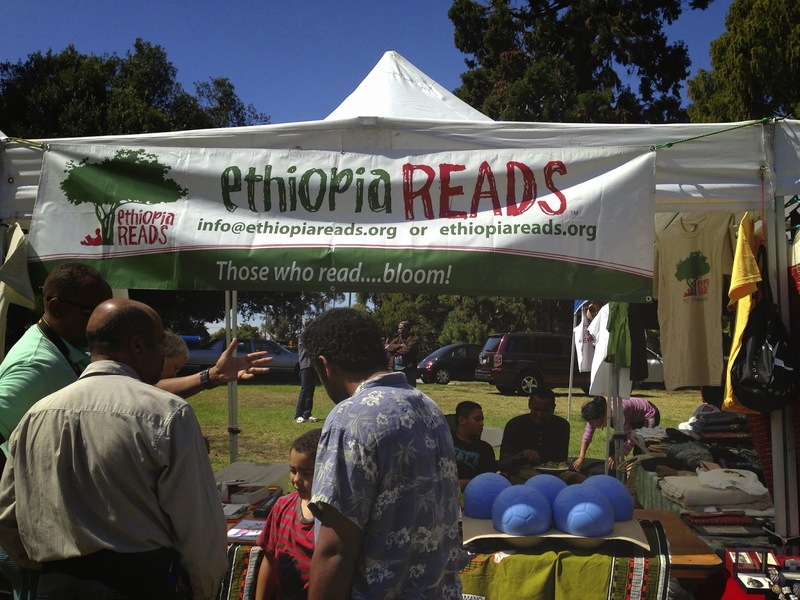 Of the two festivals, the EnquTaTash festival (sponsored by the Oakland Ethiopian Community and Cultural Center) on Saturday was certainly better funded, with about three dozen vendors, a powerful sound system, and a famous ማሲንቆ (masinqo) player flown in from Washington DC. 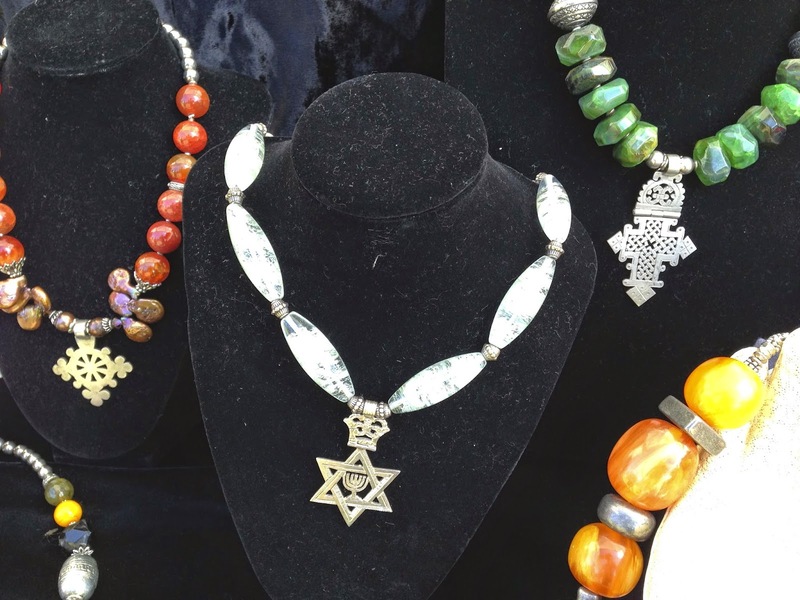 A variety of Ethiopian necklaces. If you are traveling to Ethiopia (which I am in November...more on that soon), you can take as many blue One World indestructible soccer balls as you can carry. 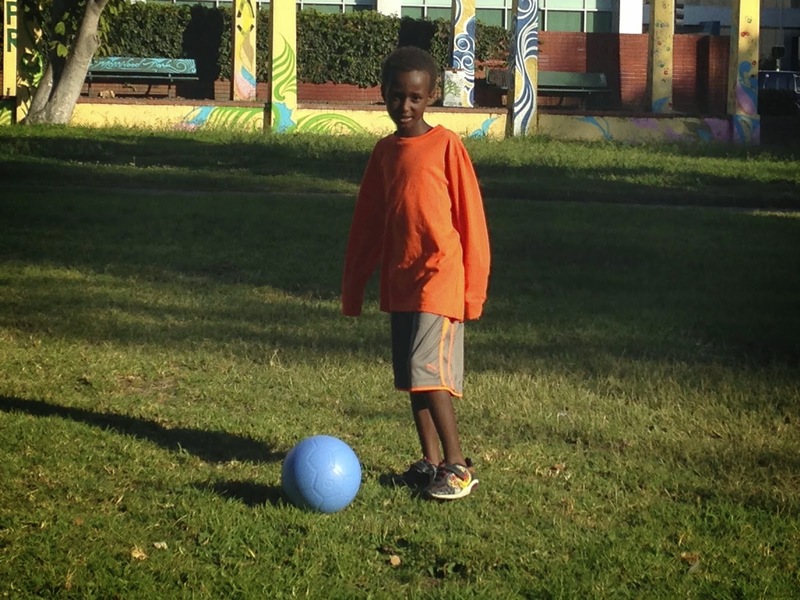 Anemo had just come from his Saturday soccer game (it was a tie), so he wanted to kick one around immediately. Here I am with Anemo and my Amharic teacher Lulit at her booth, looking a lot like Phil Dunphy. The masinqo, incidentally, is a one-stringed bowed spike fiddle, and the performer (I'll have to find out his name) proved to be a real virtuoso as well as a dynamic singer. I could understand why they flew him out. Three dancers joined him for part of his set, and by appearances, the young woman nearest the camera might be a cultural nomad herself. Later on, I was happy to see men dancing at the event as well, especially since Anemo was about to attend his first Ethiopian dance class the following morning. As a global soul myself, I've been asked occasionally why I tend to adopt an international perspective instead of a national or even local one. For instance, why do we attend cultural festivals like EnquTaTash and ignore American holidays like July 4th? Why did Suzanne and I take students around the world on summer service trips instead of using the resources needed for air travel to help disadvantaged communities here in California? Or, more pertinently, why did we choose to adopt internationally from Ethiopia instead of adopting domestically or becoming parents through the foster care system? I can provide rational answers to those questions, even if others may disagree with my answers on principle. 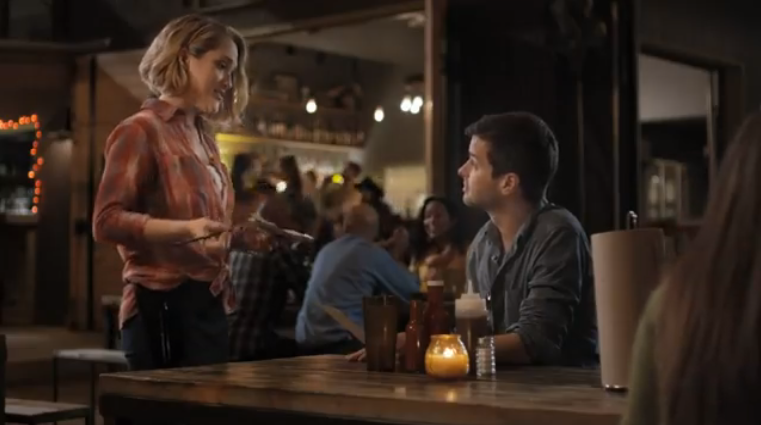 But just the other day, the foreignness of the local came rushing at me. We had decided to donate a drum kit we owned to a seventh-grade boy from Anemo's school, so he wouldn't have to walk to his church every time he wanted to practice. As I was unloading the drums in the middle of the housing project where he lived, I wondered how I could feel so out of place less than a mile from my home. I may be a global soul, but sometimes I feel like a local foreigner. Housing development at Baker and Sutter in San Francisco.